West Palm Beach, FL—A former realtor settled her suit against the Florida property owner and painting company she said were responsible for the fall on a shopping plaza ramp that allegedly caused her traumatic brain and spinal injuries, shortly before closing arguments were expected to begin in the trial. Sumner v. Lantana Palm Beach Retail, et al., 2010CA11199. Sumner, now 61, claims she suffered severe brain and back injuries in a 2007 fall on an access ramp at Lake Worth’s Lantana Square, owned by defendant Lantana Palm Beach Retail. 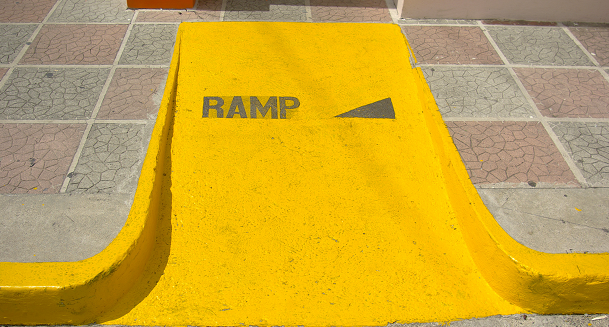 Sumner, who was a realtor working in an office at the time of the fall, blames the accident on the ramp's incline as well as a WGM paint job that she says rendered the ramp too slippery. Sumner’s attorney, Neufeld, Kleinberg, & Pinkiert’s David Kleinberg, told jurors when trial opened that his client has incurred more than $670,000 in medical expenses alone, and he would seek damages in the millions. The defendants argued neither the paint nor the ramp's incline rendered it dangerous and they challenged the severity of Sumner's injuries. The settlement announcement concluded seven days of trial in the case. Read about the trial's opening statements. Read about critical testimony in the trial. Sharon Sumner is represented by David Kleinberg, of Neufeld, Kleinberg, & Pinkiert. Lantana Palm Beach Retail LLC is represented by Matthew Martin, of Gaebe, Mullen, Antonelli & DiMatteo. WGM Quality Painting Inc. is represented by Shendell & Pollock's William Peterfriend.